Sometime around midnight 10-11 April the home of Bob Jans was firebombed in Assen, the Netherlands. Both Jans and his wife were home, asleep at the time. Prompt action by a neighbor alerted the family and the fire department. 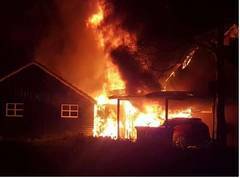 Firefighters quickly arrived to douse the flames, but not before a car, Jan’s garage, and a neighbor’s garage were destroyed. No one was injured. Death threats left for Jans made clear that he was attacked because he was developing a wind project. Dutch police are investigating the incident as attempted murder. Jans was a pioneer in commercial wind development in the United States during the early 1980s. He imported Dutch and Danish wind turbines for the fledgling American wind industry, and many are still operating in California. Since then he has continued to build wind projects in North America and Europe. According to Jans, two--possibly three--Molotov cocktails (gasoline bombs) were thrown at the house. One was thrown at the front door and a second rolled under his car near the side door. If they had both exploded, the two normal exits to the house would have been blocked. 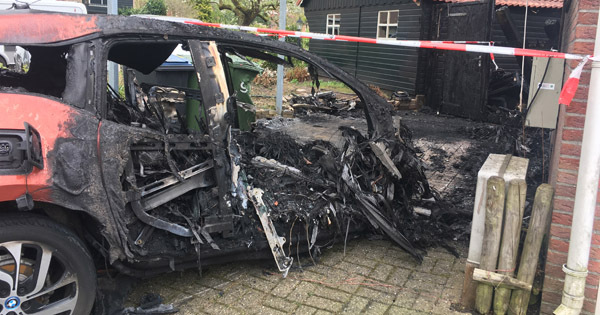 The first incendiary device failed, but the second succeeded and ignited Jans’ BMW i3, a battery electric vehicle. A nearby wooden fence and attached garage were quickly engulfed, suggesting a possible third device. The car, fence, and two garages, one containing an airplane under construction, were destroyed. The attacker left a text message for Jans: “Get out of windpark Coevorden; first warning; after this we go after your loved ones.” The attacker also sent an audio message with the sound of the fire burning. Ironically, voices heard in the background are the voices of the police when they arrived, suggesting that the arsonist remained nearby after starting the fire. Police have warned Jans and his wife, Natasha Sitnikova, not to leave home without a life alert that radios their GPS position to the police. The fire could have proved fatal. Flames reached twice the height of the house. It took the fire department three hours to extinguish the fire in part because the car’s lithium-ion batteries kept re-igniting. The fire brigade said that if they had arrived a minute later the house would have gone up in flames as well. On 17 March Jans had announced the beginning of the public permitting process to build two 3 MW wind turbines. This is the project referenced in the text message. “You have to understand, Holland is a very small country,” says Jans in explaining why two wind turbines would cause such a vicious reaction. The police lab identified the inflammable substance as a cleaning solvent. This is the first case I am aware of attempted murder against someone in the wind industry. There have been regular acts of vandalism on wind project construction sites, such as drilling holes in expensive reels of power cables and disabling construction equipment. And two turbines were burned down in France. Others in the wind industry have received death threats, veiled or direct, by anti-wind activists. All Earth Renewables’ Dave Blittersdorf received a call from a woman threatening, “You should be dead, you’re a bad person,” for one of his projects in Vermont. Another left an anti-Semitic rant against Blittersdorf, misidentifying his last name as Jewish. Blittersdorf, like Jans, has been working with solar and wind energy for decades. His wind credentials go back to the late 1970s. Blittersdorf is a public figure in Vermont, where he’s a well known entrepreneur and philanthropist. He also builds wind and solar plants, and, to the chagrin of his enemies, he’s not afraid to speak his mind. “They’re pushing the limits,” says Blittersdorf of anti-wind activists, “And they’re getting violent. They demonize us for doing wind and solar.” Blittersdorf didn’t have to add that it’s a short step from demonizing someone to physically attacking—or killing--them. One night he saw a hooded image on his game camera at the gate to his mountaintop retreat. He called the police who found a severed head of a doe at the gate. The police reported that if they found the perpetrator they could only charge them with . . . littering. In mid-November 2006, vandals fire-bombed a small wind farm in Languedoc-Roussillon near the village of Roquetaillade. The project of Gamesa turbines was developed by Jean-Michel Germa’s Compagnie du Vent in the nearby city of Montpellier. Two turbines were destroyed. This may have been the first successful attack on wind turbines. This action was identified as sabotage in the French press, in part because it occurred simultaneously with a march of anti-wind demonstrators elsewhere in France.